Quirky Jessi: Veggies that taste like cupcakes! No, really! 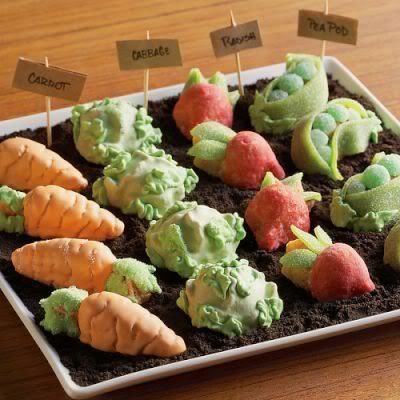 Veggies that taste like cupcakes! No, really! Yep, it's a garden cupcake or cake pan...or as they call it on the site, "cakelet pan." I thought it was perfect for the upcoming Spring weather (and Earth Day, of course). Even the kids will eat these vegetables, hehe. It's certainly quirky! And I'd rather have vegetables that taste like cupcakes than the other way around. I do wonder what it would be like eating the earth though. Wow - those look scrumptious. I just wanted to say thanks for signing up for our newsletter. When I ran the randomizer tonight, you came up as number 7 out of more than a thousand subscribers. Pretty lucky if you ask me!